My advice, if possible, leave your gilding alone except to appreciate the most uniquely beautiful and most noble of metals, it is an element after all. If it needs to be repaired or cleaned, please call me. Bart Bjorneberg, Bernacki & Associates, Inc.
We had a large gilded frame that was crated after being wrapped in fabric moving pads. The crate was exposed to water and by the time the crate was opened, the pads were glued to large sections of the frame requiring that much of the frame had to be re-gilded. sections of the rosette corner blocks and been pulled away from the substrate. Along the lower sections on the outside face of the frame mold had begun to grow. Small pieces of ornament, gesso and gilding were entangled in the blanket or lay at the bottom of the crate. 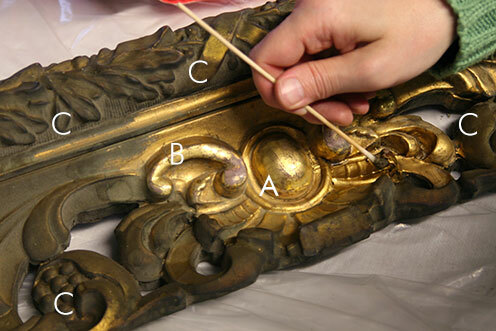 The gold leaf supplied by Wehrung & Billmeier Gold Leaf Company from Chicago, Illinois was applied to the areas of loss. The restored mirror was secured in the custom built crate.